It’s almost Easter and I am already looking forward to Easter leftovers. I know it may not be a holiday normally associated with leftovers, but it is in our house. We have a close friend who gives us a certificate for a free ham each Easter, I guess that makes that close friend a very, very special friend. Being a minister’s wife on Easter doesn’t leave much time in the kitchen, so I take all the “free” help I can get. Two leftovers that we always have after Easter lunch are mashed sweet potatoes and ham. I slice all the remaining ham and the ham bone gets frozen for a future pot of beans. I portion out the sliced ham for sandwiches and recipes-nothing like a hot ham and cheese sandwich on toast for me and these Ham and Sweet Potato Tots. I don’t know what it is about tater tots, but they always make me feel like a kid. It’s as if my mind is telling me that tater tots are for children only not for adults. Do you hear that in your mind, too? Maybe it’s because there are no utensils required and they are so easy to pop in the mouth. These tater tots, made with only five ingredients and under 20 minutes, make an easy transition from breakfast to brunch and lunch to dinner. These are not your average little tot, these are hearty tots. I wanted to do a dipping sauce for this recipe, but the sauces I like with these tots vary from meal to meal. For instance, for breakfast, I like the tots with apple butter. For brunch, I like them with a poached egg and a dollop of orange marmalade. For lunch, I like them lined up in a hot dog bun with some spicy mustard, and for dinner…as is, as a perfect side. In a bowl, combine ham, sweet potatoes, and egg. Sift flour, baking powder, and salt together and add to ham mixture. Using a wooden spoon, gently fold together until dough is formed. Grab dough by teaspoons, roll each into a ball. Spray non-stick spray or olive oil into each well of a mini muffin tin. Put balls into greased tin. Bake 10 minutes. Using a spoon, gently flip each tot. Bake an additional 5 minutes. Put on Your TO COOK IS TO CREATE Thinking Cap: No leftover mashed sweet potatoes? Use regular leftover mashed potatoes and yummy bonus if they are fully loaded. Want to turn these tater tots into an appetizer? Roll each tot into minced pecans before baking. Adjust seasonings depending on what is already in your mashed sweet potatoes like maple syrup and cinnamon. No leftover ham? Make all veggie tots. Have leftover broccoli? Grind it and add it. Have any other leftover meat like pork chops, pork tenderloin, or even steak? Grind it and add it in place of ham or add crumbled bacon. Want a quick dipping sauce? Use spicy mustard, BBQ sauce, maple syrup, honey, apple butter, or orange marmalade. Still have leftover ham? Make one of my other Easter leftover favorites: Club Sandwich Meatballs. Ham and Sweet Potato Tots: We too always have some left over sweet potato casserole and ham. 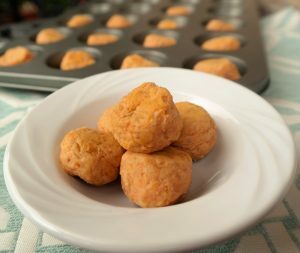 This recipe of Tater Tots is so quick and easy. The very best thing is that they are so DELICIOUS! A meal in themselves. YUM!